With Insure4Music, you can build your own policy so you only pay for what you need. 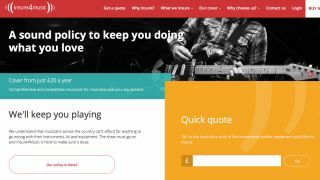 Insure4Music, a new music insurance brand launched, promises the quickest, easiest and best value musical instrument and equipment cover in the UK. With 17 years' experience in specialist insurance, the team behind Insure4Music recognises the limitations of many household policies when it comes to providing affordable and dependable cover for the specific needs of musicians, bands, DJs, singers and music teachers. The result is a comprehensive music insurance policy that can be built around each individual or band's requirements, meaning you only pay for what you need and not a penny more. "Any musician who plays live is aware of the need for Public Liability insurance. This insures you in case you injure someone else, or cause damage to a venue when playing," said John Woosey, Managing Director of Insure4Music. "Sadly incidents involving equipment can also happen, with music gear being stolen out of the back of a van or the head snapping off a treasured guitar. It's often not until the worst happens that people discover the inadequacies of their standard household insurance, which may not cover your instruments outside the house at a performance or practice or, in some cases, completely exclude them." Insure4Music makes it simple and quick to sort out the right insurance for you. Build your own policy so you only pay for what you need. So if you don't play live at gigs venues, then why pay for public liability insurance? Annual policies start from £20 and are available from Insure4Music or by calling 08000 469 859.